The stars of our Galaxy should revolve around the central nucleus in a manner similar to how the planets revolve around the Sun, that is, with a rotating motion in which there is a balance between centrifugal and centripetal force. The dynamic equilibrium that is established allows to relate the rotation speed to the mass of the galaxy: this is the basis of the estimates of dark matter. Based on the Gaia DR2 data, we have obtained the most extensive velocity maps of the stars of our galaxy. These maps question the hypothesis that the stars rotate with only circular motions. In fact, radial and vertical motions of considerable intensity have been detected as well as differences in the speed of rotation in different regions of the Galaxy. In these years, the Gaia mission is taking place, a satellite of the European Space Agency designed to investigate the origin, evolution and structure of the Milky Way. In particular, the objective of the mission is to perform highly accurate astrometric measurements, determining the position of about a billion stars. The Gaia collaboration has just released the data release 2, which at the moment is the largest and most accurate catalog of positions, velocities and other stellar properties containing information of over a billion stars. In particular, it is now possible to explore the phase space (positions and velocities) of more than six million stars of the galaxy disk. The maps of the stellar velocities published by the Gaia collaboration cover a distance up to 12 kpc (i.e. 4 kpc from the Sun – being about 30 kpc the size of the disk of the galaxy, and being the Sun at 8 kpc from the center). 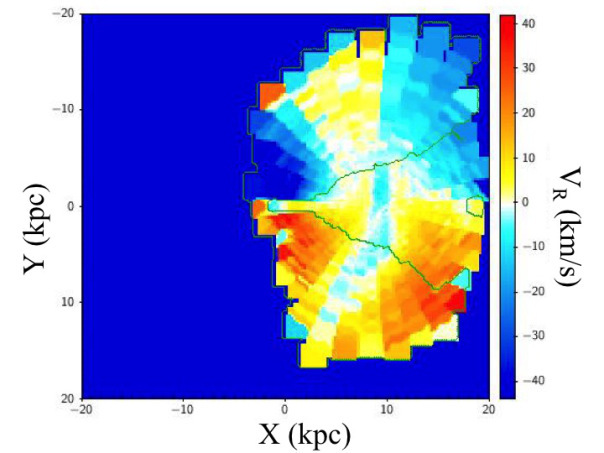 We were able to extend Gaia’s velocity maps up to 20 kpc (i.e. up to 12 kpc from the Sun, three times more than the official Gaia collaboration maps): this was possible using a statistical reconstruction of the distance for those stars (the majority at the moment) that have an error inthe estimation of their distance of the order of the distance itself. In fact, it is possible to use a de-convolution method, which assumes the simplest hypothesis on the nature of statistical errors in measurements (ie, that they are Gaussians) to obtain a reliable estimate of the distance. In this way we have therefore measured significant deviations from the circularity in the average orbits of the disc stars, together with a radial velocity gradient of about 40 km/s and a vertical velocity gradient of 20 km/s. These are characteristics that clearly indicate that the Milky Way disc is not a symmetrical system with respect to the axis of rotation and it is not close to a condition of dynamic equilibrium; on the contrary it is characterized by motions in all three components of velocity. In a billion years, i.e. the characteristic time scale of the Galaxy, a star moving at a speed of 10 km/s can travel about 10 kpc. Thus, the observed coherent motions induce a large-scale change of the galaxy’s morphology on relevant time scale from an astrophysical point of view. Therefore, at present, it is clear that the Milky Way is far from a simple stationary configuration in rotational equilibrium. These results therefore question the most basic hypothesis of stellar dynamics, that of stationarity, and show that the modeling of the galactic disc as a symmetric system with respect to the rotation axis and independent of time is not supported by the data. From a point of view of the theory of galaxy formation this situation opens up new and fascinating challenges, where the dynamics of out of equilibrium systems will necessarily have to play a key role. There are also important implications for what concerns the estimation of dark matter in our galaxy, which is generally assumed that the galaxy has reached a state close to the dynamic equilibrium. The existence of large-scale coherent motions implies that this hypothesis is not satisfied and therefore the material estimates will be reviewed in the light of a new dynamic model.